Nestled at the foot of the Sangre de Cristo Mountains, the fabulous community of Eldorado at Santa Fe offers an excellent location, fantastic residences, easy access to plentiful entertainment opportunities, and much more. Regardless of your interests, you will not struggle to find enjoyable activities to fill your free time when you are a resident of this community. Available properties in Eldorado, New Mexico, include beautiful single-family homes, and you are sure to find something that suits your style. Now is the time to consider what it would be like to live in this lovely community. Whether you are interested in nature, local events, or metropolitan life, you will have ample entertainment options when you are a resident of this community. For example, if you like spending time outdoors, then you will appreciate the close proximity of parks and natural areas that will allow you to soak in the sunshine and enjoy the gorgeous scenery. Hiking, biking, jogging, and picnic lunches can become part of your everyday life when you live in this community. You may also choose to attend fun local events such as holiday celebrations and parades. When you are ready for a more metropolitan adventure, look no further than vibrant Santa Fe and its famed Plaza. Because Eldorado is located near this dynamic capital city, the city’s attractions will be easily within your reach. Excellent restaurants, interesting museums, impressive galleries, and a blossoming art scene are only a small sampling of what you will enjoy in this city. Envision dining in one of your favorite restaurants before attending a captivating live performance. No matter where your adventures lead you, you will be content to think of your Eldorado home awaiting your return. A convenient location, stunning scenery, and attractive residences are only a few examples of what you will like about living in this community. 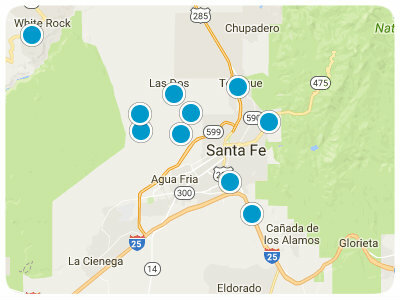 Homes for sale in Eldorado at Santa Fe are ready to pique your interest, and you are sure to find something that impresses you. If you are ready for more information regarding Eldorado at Santa Fe real estate options, please do not hesitate to contact us. Breathtaking views await your dream home in the highly sought after community of El Dorado. Come see the last available lot located in this charming cul-de-sac today! The data relating to real estate for sale in this web site comes in part from the Internet Data exchange ("IDX") program of SFAR MLS, Inc. Real estate listings held by brokers other than Berkshire Hathaway HomeServices are marked with the IDX Logo. All data in this web site is deemed reliable but is not guaranteed. IDX information is provided exclusively for consumers’ personal, non-commercial use, that it may not be used for any purpose other than to identify prospective properties consumers may be interested in purchasing, and that the data is deemed reliable but is not guaranteed accurate by the SANTA FE ASSOCIATION OF REALTORS®.